I finished off the moderate songs yesterday, and did the first three challenging songs. I didn’t manage to 100% any of the moderate songs; some of them I’m fairly confident that I could get 100% on if I tried hard enough, but on many of them that’s not the case. In general, I’m finding songs at this level to be a lot of fun to play and learn: it’s hitting the sweet spot of being complex enough that I enjoy the music and enjoy the learning process while not overwhelming me. I’m up to rank 77 now, with a little over 8 million points; that’s up 19 positions and about 550,000 points compared to last week. That’s an average improvement of almost 70,000 points per song; if I can keep that up, I’ll end up somewhere in the mid 30’s. Which isn’t completely crazy—I’m in that area for a fair number of individual songs—but of course other people are improving as well. Still, hitting 50th place doesn’t seem as unachievable as it once did. If things go well, I could even conceivably get a score of ten million; we’ll see how close I end up, and if the answer is “very close” I’ll probably go for it. 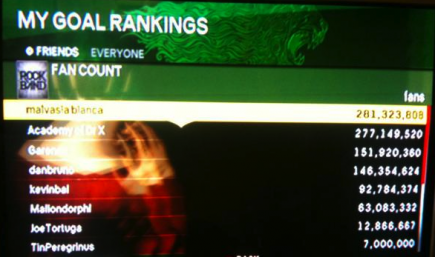 My apologies for the crappy screenshot: I don’t see a way to get that leaderboard on the Rock Band website. Which is too bad, because that screen shot is out of date: I’m actually at 289,672,432 fans now. Though I imagine that Jonathan will pass me again soon: the main reason for my recent climb is that Liesl and I finished off the road challenges over the last two weekends (we still have gold medals to earn on some of them, but at least now we’ve completed everything), and that’s given me a nice bump. It looks like he’s going through songs on guitar and keys now; that should give him a convincing lead over me. I’m not positive, but I think the Fan Count leaderboard scores do not include fans earned from DLC Achievements. Your actual fan count total may differ from the one on the leaderboards. Yeah, could be – that would certainly be more fair. Though I can attest from my obsessive pro keys rank checking that there is definitely a delay before at least some of the leaderboards get updated, so there could be multiple factors involved.